To tie in with the second instalment of the new Harry Potter spinoff series, Fantastic Beasts and Where to Find Them, LEGO is releasing a toy set modelled after the Great Hall at Hogwarts School of Witchcraft and Wizardry. 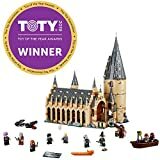 Below is some information on this new set, which is scheduled to hit the shelves on August 1st.LEGO Harry Potter Hogwarts Great Hall 75954 Building Kit and Magic Castle Toy, Fantasy Creatures, Hermione Granger, Draco Malfoy and Hagrid (878 Piece) Will be a huge must have for Christmas lists. This set includes 878 pieces and impressively detailed features and figurines. It will sell for about $100. The entire set, once constructed, stands at around 14’’ high, 6’’ wide, and 11’’ deep and is 4 levels high at the tower. While the set is not connected to the Fantastic Beasts spin-off, the figurines are based off all our old favorite Hogwarts students and characters. Among the ten human figures are the main trio: Harry Potter, Ron Weasley and Hermione Granger. You will also see antagonists and villains like Draco Malfoy and Professor Quirrell—with a spinning head featuring Lord Voldemort’s face on the back, just like in Harry Potter and the Sorcerer’s Stone! Other characters included are Albus Dumbledore, Professor McGonagall, Nearly Headless Nick, Hagrid, and even a LEGO set debut with Susan Bones. There are even some animal and mythical creature figurines in the set too, including Harry’s owl Hedwig, Dumbledore’s Pheonix Fawkes, Ron’s rat Scabbers, and even the Basilisk from Harry Potter and the Chamber of Secrets. Many of these figures are newly molded specifically for this set, and have notable differences and improvements compared to previous versions released by the toy company. For example, characters like Harry, Ron, and Hermione are shorter to reflect the Sorcerer’s Stone/Chamber of Secrets theme of the set. The Hagrid figurine includes a pink umbrella and lantern. Also, the wands are more detailed and realistic, as well as the hair styles on Harry and Hermione. Some key props that harken back to the earlier films also come with the set, including a grand staircase that actually moves, the Mirror of Erised, which comes with changeable “reflections,” and a roost for the Fawkes figurine. There are also a handful of recognizable rooms, such as a potions room and treasure room. In the main Great Hall, the wall is decorated with reversible house banners, house tables, the sorting hat, and more. All in all, this set has some impressive details that will delight any Harry Potter fan and merch collector. As you have read, the Hogwarts Great Hall Lego Set comes with an impressive amount of accessories and figures, and the designers have clearly paid a lot of attention to detail. There are even more features that haven’t been mentioned in this article, and enough references to the first two movies to keep any Harry Potter fan entertained for hours on end. It is clear that the designer behind this set from LEGO is a true fan. While it is not exactly a set created with Fantastic Beasts in mind, there is no doubt that it is something Potterheads will love all the same.